Speaking about Korean food, people often think of Korean BBQ or Fried Chicken which has been so well known if you’re a Korean Drama or K-Pop Fanatic. But do you know there is more than just Korean BBQ and Fried Chicken? Gejang (게장), consists of 2 words, ‘Ge’ means crab and ‘Jang’ means sauce in Korean. There are 2 types of typical gejang, Ganjang Gejang (간장게장) which is fresh raw crab marinated with Soy Sauce and another type is marinated with Spicy Sauce namely Yangnyeom Gejang (양념게장). How does it feel like having Fresh Raw Crab? I really love eating crab even in Malaysia or Singapore, it taste really good when it’s cooked with different sauces, but when I first heard of eating Raw Crab, my face kinda turn green. What really inspired me to have Gejang is really the Korean TV Reality show that I watched, the way they described it on TV really got my attention. How much does it cost for having Gejang? Gejang can be relatively expensive, as we know seafood are often more pricey than other foods, normal price for ganjang gejang per dish with 2 crabs is about 11,000krw. That is the reason WHY YOU SHOULD GO FOR UNLIMITED REFILL gejang restaurant! Hongdae Hong il-poom is one of the Eat All You Can Ganjang Gejang restaurant in Seoul, with just 19,900krw, you can have unlimited refill of Ganjang Gejang. Get 5% Discount and pay only 19,000krw when you book with Indiway! What do you get with 19,000krw? Tips: Try to eat the Crab Shell with 1 or 2 spoon of rice, mixed it well with the sauce and crab’s egg, it does taste really superb! It’s very easy to redeem at the restaurant, just show the voucher on your mobile, screenshot the email confirmation you got from Funko. 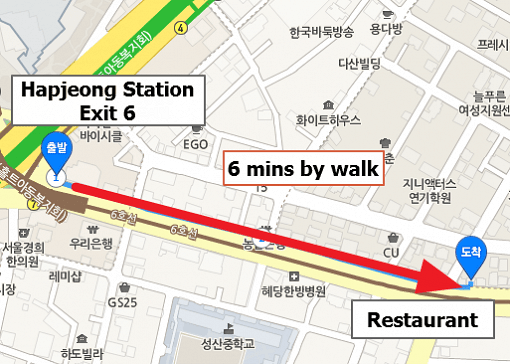 How to get to Hongdae Hong il-poom? 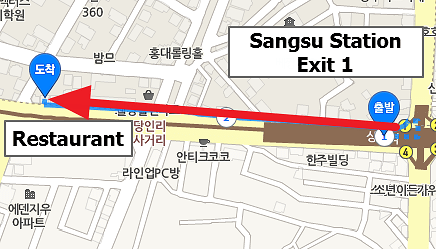 It’s really easy to find Hong il-poom from subway station, there are 2 subway stations within walking distance, one is from Hapjeong Station (Line 2/Line 6) Exit #6 or Sangsu Station (Line 6) Exit #1. Book your food voucher with Indiway today and get your 5% Discount!